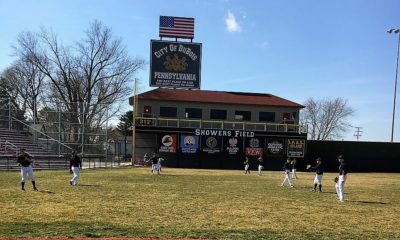 DUBOIS, Pa. – DuBois scored three runs in the bottom of the sixth to earn a 7-6 victory over visiting Punxsutawney. Sarah Henninger and Lauren Walker led the Lady Beavers with a pair of runs. Maddy Ho had a run and two RBIs. Cate Gregory went 2-for-3 with a run and Saige Weible chipped in for a pair of hits and an RBI. Abby Gigliotti tripled and added a run to pace the Lady Chucks. Riley Presloid had two RBIs with Madison Stonbraker and Kendal Johnston each chipping in for a pair of hits. Sarah Wever went 2-for-3 with a run and two RBIs. Aleigha Geer started the game for DuBois striking out two while allowing nine hits and six runs in five innings in the circle. Weible finished the game with four strikeouts. Elliott Ferrent took the loss for Punxsutawney giving up three hits and the winning run in the final inning. Johnston pitched the first five innings and struck out five while allowing nine hits and four runs. EMPORIUM, Pa. – Despite home runs from Alyvia McKimm and Laila Smith, visiting Otto-Eldred scored three runs in the eighth inning to defeat Cameron County, 7-5 and remain unbeaten. Gabby Nickerson and Kaylee Heller led the Lady Terror offense with a pair of runs. Abby Wolfe doubled and drove in two runs while Emmalee Sheeler went 2-for-3 with a run. Smith went 3-for-4 and McKimm went 2-for-4 with two RBIs to pace the Lady Red Raiders. Taylor Britten and Ashlea Burgett each doubled and added a run. Wolfe pitched all eight innings and struck out 10 while giving up 12 hits and three runs in the win for Otto-Eldred. For Cameron County, Smith struck out 11 but gave up six hits, five walks and seven runs in the loss. 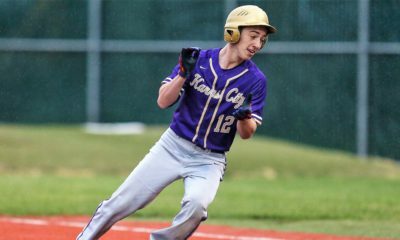 COUDERSPORT, Pa. – Coudersport scored 10 runs in the first inning and went on to defeat visiting Oswayo Valley, 21-11 in five innings. Chelsey Streich and Paiton Whipple each scored four runs to lead the Lady Falcons offense. Kaylee VanWhy homered and drove in four runs while Rosalyn Page went 2-for-2 with two runs and four RBIs. Emma Saulter doubled and had a pair of runs with Claudia Miller driving in two runs. Shaelyn Black went 3-for-4 with three runs scored and two RBIs. Karina West paced the Lady Greenwaves going 2-for-4 with three runs and two RBIs. Karley Carpenter drove in three scores to go along with a pair of hits and two runs while Layla Phillips tripled and added three RBIs. Macy Went and Kelsey Turk each chipped in for a pair of runs. Saulter got the win in the circle for Coudersport giving up 10 hits and 11 runs while striking out four and walking four. Cami McNany led the Lady Falcons offense with two home runs and five RBIs. Emily Wetzel and Baylee Blauser each had three runs scored with Andrea Meals driving in two scores to go along with a run. Sydnie Schmidt went 2-for-3 with three runs and Meah Lelase had a team-high four RBIs. Cassidy Makray paced the Lions with a solo home run. Blauser earned the win with seven strikeouts and two allowed hits in the win for A-C Valley. Makray took the loss for C-L and gave up seven hits and nine runs while striking out four. GALETON, Pa. – Despite six combined runs from Alyssa Burchel and Mirissa Bliss, visiting Northern Potter fell to Galeton, 16-8. Jessie Evans led the Lady Tigers going 3-for-4 including a triple and five RBIs. Katie Pagano drove in three scores while adding a pair of runs. Cara Parsell and Brielle Kalacinski each doubled and had three runs. Bliss went 3-for-4 with three runs and two RBIs for the Lady Panthers with Burchel adding three runs. Megan Hyde drove in two runs and had a pair of hits while Rylee Copp singled on her way to a run. Regan Fuller earned the victory for Galeton striking out seven while giving up six hits and eight runs. Hyde took the loss in the circle for Northern Potter allowing 10 hits and six runs to go along with five strikeouts and a walk. CLARION, Pa. – Jordan Best went 3-for-3 and drove in three scores to go along with two runs to help Clarion defeat visiting Brockway, 15-0 in four innings. Brenna Campbell went 3-for-4 including a double and had a pair of runs scored for the Lady Cats. Kaitlyn Constantino and Ava Kiser each doubled and added a run while Carly Best added three. Noel Anthony tripled and chipped in for a run. Mackenzie Fields doubled to pace the Lady Rovers with Emily Botwright and Callie Barber each chipping in for singles. Constantino and Payton Simko split time in the circle with Constantino earning the win giving up one hit and striking out six. Simko struck out four and allowed two hits. HYDE, Pa. – Clearfield scored 11 runs in the bottom of the fourth to earn a 15-3, five-inning victory over visiting Bradford. Emma Hipps led the Lady Bison offense going 2-for-3 with three runs and two RBIs while Karly Rumsky drove in three scores to go along with a pair of hits and two runs. Morgan Cheek tripled and had a pair of runs with Olivia Bender adding a pair of hits and two RBIs. Kylee Hertlein and Alexis Benton each doubled. Emily Warner singled and drove in a score for the Lady Owls. Mackenzee Maley, Adrienne Angell and Alyssa Hardy each had a run. Bender gave up one hit and struck out seven in the win for Clearfield. WILLIAMSPORT, Pa. – Williamsport used a balanced scoring attack to defeat visiting St. Marys, 14-2. Emma Dikey had three runs to lead the Lady Millionaires scoring. Laney Stone went 2-for-4 with a run and three RBIs while Sam Reeder drove in four scores and added a pair of hits. Britney Shaw paced the Lady Dutch with a pair of hits and two RBIs. Tessa Grotzinger and Mckenzie Gillen each had a run scored. Lynna Robertson struck out two and allowed one hit in the win for Williamsport. Maura Fledderman pitched 3 ⅓ innings in the circle and took the loss for St. Marys giving up seven hits and 13 runs while striking out two. BROOKVILLE, Pa. – Rachel McCauley and Tamera Flinchpach combined for six hits and four runs to help visiting Cranberry defeat Brookville, 13-3 in five innings. McCauley went 3-for-3 with a pair of runs and two RBIs while Flinchpach went 3-for-4 with a pair of runs to lead the Berries offense. Jenna Reynolds tripled and drove in a pair of runs while Megan Hadden chipped in for a pair of hits. Malliah Shreck doubled with two RBIs and Kaylie Bruce singled while adding three runs. Lauren Hergert had two RBIs and a run to pace the Lady Raiders. Ashton Pangello and Dani Maring each singled and chipped in for a run. Jenna Seigworth struck out four and allowed four hits to earn the victory for Cranberry. 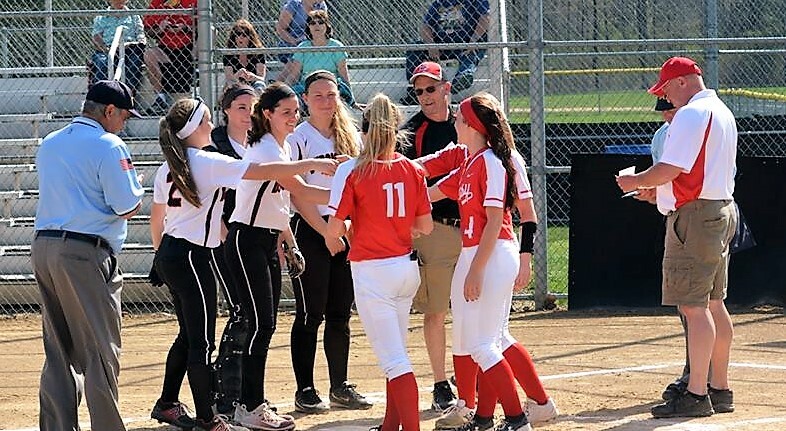 BROCKWAY, Pa. – A seven-run third inning propelled Brockway over visiting Clarion. 15-5. For the Rovers, Zane Puhala went 3-for-5 with three runs while Benjamin Glasl had an RBI and three scores. Tyler Serafini tripled and drove in three runs and Santonia Inzana had a multi-hit game to go along with a run. Hunter Allenbaugh chipped in for a pair of hits and three runs. Calvin German and Skyler Rhoades each had a pair of hits to pace the Bobcats. Drew Wrhen tripled and added a run while Christian Simko, Cam Lapinto and Cole Wrhen each had a run. Inzana got the win for Brockway giving up seven hits and five runs while striking out four and walking three. Skyler Pastor pitched two innings on the mound for Clarion and gave up three hits, two runs and three walks in the loss. PORT ALLEGANY, Pa. – Howie Stuckey struck out 11 batters and gave up one hit to help Port Allegany defeat visiting Portville, 10-0 in five innings. Trey Ayers went 3-for-3 and drove in two runs for the Gators while Drew Benson and Stuckey each scored a pair of runs. Montgomery Tanner went 2-for-2 with two RBIs and Ethan Sprankle chipped in for two runs. Ty Guilds and Boots Cade each singled and added a run. Brandon Murray had the lone hit for the Panthers. Michael Stillman gave up 10 hits and seven runs in the loss for Portville. BROOKVILLE, Pa. – Cole LaBenne went 2-for-2 with a pair of runs and two RBIs in Brookville’s 8-3 victory over visiting DuBois Central Catholic. Chase Palmer and Brady Caylor each singled and had a run scored for the Raiders. Seth Dunkle had a hit and Jace Miner added a run. Hunter Roney and Dane Lyle also chipped in for a run. Dom Torretti homered and drove in two runs to pace the Cardinals. Tyler McIntosh had a pair of hits with Justin Miknis and Brandon Walker each adding a run. Aaron Park struck out eight and allowed five hits on the mound in the win for Brookville. Cole Sansom lasted 3 ⅓ innings in the loss for DCC giving up four hits, five runs and five walks. ST. MARYS, Pa. – Brandon Sicheri scored three runs to help St. Marys defeat Elk County Catholic, 7-2. Nate Beimel led the Dutch going 2-for-3 including a double while driving in four scores. Shane Price singled and drove in two runs while Matt Bellina, Connor Bressler and Greg Tettis each scored a run. Brennen Klawuhn went 2-for-3 with a run to pace the Crusaders. Tylor Herzing added a score and Ryan Fritz had an RBI. Beimel got the win for St. Marys, striking out 15 batters while allowing one hit and two runs. Brady Schneider pitched 2 ⅔ innings on the mound and gave up four hits and five runs while striking out four for ECC. STRATTANVILLE, Pa. – Colby Himes went 3-for-4 and scored three runs to help Clarion-Limestone shut out visiting A-C Valley, 12-0. Curvin Goheen homered and drove in three scores for the Lions while Drew Beichner went 3-for-3 with three RBIs. Camden Hankey had a pair of hits and two runs with Ian Larson adding three runs. The Falcons managed three hits that came from Luke Whitcomb, Broc Weigle and Gary Amsler. Goheen got the win for C-L striking out eight batters and walking one. Caleb Penny and Amsler combined to give up 13 hits, 12 runs and five walks. COUDERSPORT, Pa. – Kolby VanWhy and A.J. Redmon combined for four runs to help Coudersport defeat visiting Oswayo Valley, 10-0. Redmond went 3-for-3 with a pair of runs and an RBI to lead the Falcons offense. VanWhy tripled and had a pair of runs with Eli Ayers driving in four scores. Jackson Glover went 3-for-4 with a run with Shae Osgood and Derek Easton each adding a single. Gunner Bean had the lone hit for the Greenwaves. Kullen Crosby struck out nine batters in the win for Coudersport. For Oswayo Valley, Sawyer Prince gave up 12 hits and nine runs while striking out six in the loss. 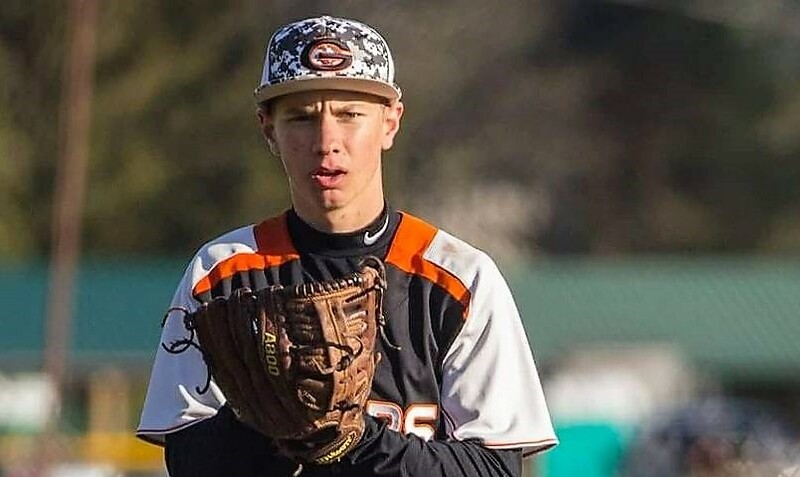 MARTINSBURG, Pa. – Eli Glass went 3-for-3 and drove in four runs to help visiting Clearfield defeat Central-Martinsburg, 10-4. Nathan Barr had a pair of hits including a double and three runs for the Bison while Caullin Reed went 3-for-4 scoring a pair of runs to go along with two RBIs. Hayden Williams doubled on his way to a run and had an RBI with Allen Myers and Harrison Peacock each chipping in for a run. Hunter Klitz and Devon Boyles paced the Dragons with a pair of hits. Noah Muthler singled and had a run while Thad Albright drove in a score to go along with a run. Cade Walker struck out seven and gave up six hits to earn the win for Clearfield. Dylan Focht took the loss for Central-Martinsburg giving up seven hits and seven runs in two innings on the mound. Jacob Eberlin pitched 4 ⅔ innings in relief and struck out three while allowing four hits and three runs.